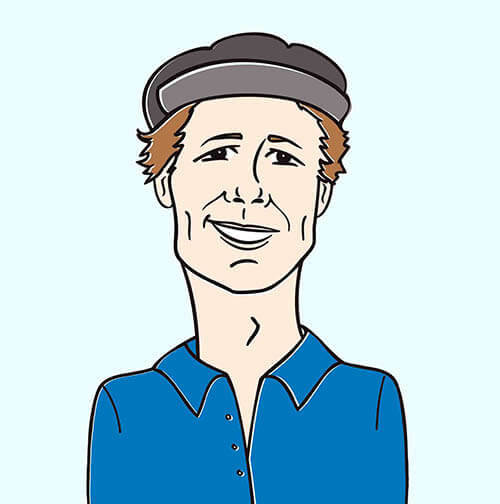 Hey everybody, it’s Andy Gesner and the staff from HIP Video Promo, here with an exciting clip from what just may be the world’s most thrilling band. 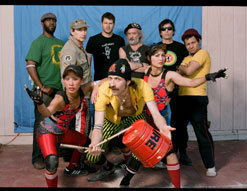 If any group on earth deserved a live video — and a live DVD to match — Gogol Bordello is that group. They’ve blown away stadium crowds at Leeds and Bonnaroo, introduced highbrow audiences at the Whitney Museum and the Venice Biannuale to the pleasures of reckless rock and roll, and delighted fans in countless sold-out houses everywhere in between. Their concert performances are the stuff of legend: invigorating, wildly exuberant, thoroughly exhausting shows that leave audience members breathless and begging for more. A Gogol Bordello gig is a cultural collision, a sonic explosion, a barrier-crossing, genre-defying trip through uncharted sonic terrain. It’s a swirl of light and color, a clash of fiddle and accordion and punk guitar, a dazzling hybrid of Gypsy soul, Eastern European stomp, and ruthless American punk. And holding it all together is the fiery, spectacularly-mustachioed Eugene Hütz, who is widely recognized as one of the most charismatic frontmen working in any musical genre, in any scene, in any nation. By now, the remarkable Eugene Hütz backstory is well-known. Born in Europe to the descendents of Gypsies, his family fled to resettlement camps in the wake of the Chernobyl meltdown. Hütz came to America as a refugee — and immediately went about assembling the band that would become Gogol Bordello. He didn’t look for a multi-cultural lineup, but in a place as polyglot as New York City, a multi-cultural lineup was bound to find him: two Russians (violinist Sergey Ryabtsev and accordionist Yuri Lemeshev), an Israeli punk (guitarist Oren Kaplan) and an American hard rocker (Eliot Ferguson) and two backing vocalists and dancers who trace their ancestry to Thai-American and Chinese-Scottish sources (Pam Racine and Elizabeth Sun, respectively). Together, they’ve made some of the most incendiary recordings of the decade, contributed new phrases to the punk lexicon, and received adulation from rock’s most notable critics. Robert Christgau recently called Gogol Bordello “the most visionary band in the world”; praising Eugene Hütz’s “politics of joy”, he promised listeners that once they were acclimated to the Gogol sound, they’d soon discover that the septet was one of the world’s hardest-rocking, too. If all this exposure hasn’t exactly turned the edgy Hütz into a pin-up, it has undeniably made him a subject of intrigue for international audiences. Earlier this year, Gucci introduced a line inspired by his eclectic and arresting sense of fashion. Madonna casted him as the lead in her debut film Filth And Wisdom. A natural actor, Hütz also appeared (and played Gogol Bordello songs) in the movie version of Everything Is Illuminated. The Pied Piper of Hützovina, a documentary about the singer’s travels across Eastern Europe, has played to fans all over the globe. Live from Axis Mundi, the band’s latest DVD project, assembles footage captured at Irving Plaza in New York City: a true home away from home for this restless band of travelers. It can’t replace the pure rush of seeing Gogol Bordello in concert. But it’s the next best thing, and the next best thing is still pretty damned great. We’re thrilled to have the opportunity to work with such a distinguished artist, and we have the good folks at Side One Dummy Records to thank! If you need more info, call Andy Gesner at 732-613-1779 or e- mail us at info@HIPVideoPromo.com . You can also visit www.SideOneDummy.com or www.GogolBordello.com to find out more about Gogol Bordello.